Dining with littles is no small task. My husband and I are foodies, and we enjoy the mystery of going to new restaurants and trying different foods. When our girls were small, it didn’t take long to realize we needed some kid-friendly strategies for eating out. Nothing can break the spirit of a mom like a screaming preschooler in a crowded restaurant … in front of her sister … and her sister’s perfect kids … and her parents … and her judgmental great aunt. Below are a few survival skills we learned along the way. I know it’s not popular, but in the same way couples need phone-free date nights, families need phone-free mealtimes. Phones and tablets are convenient, but they are not creative. The overuse of media can lose its luster for you, your spouse and your preschooler. Don’t let Facetime interfere with your family’s face-time. Still not convinced? Some restaurants are beginning to offer discounts to phone-free-patrons as an incentive to encourage fully engaged dining. Chick-fil-A is offering free ice cream to families who put their phones in the “phone coop” during their meal. Go old school and prepare creatively. Play-Doh is gold. Buy a party pack of 20 mini Play-Doh cans from the party favor section of your favorite store. Keep the whole bag of Play-Doh goodness in your diaper bag, purse or van. It is a super fun table activity and can be thrown out when dinner is over. Repurpose Altoids tins by storing toys in them to be kept in your purse or diaper bag. If you have an older child in tow, Altoids tins are great containers for the Lego enthusiast. Keep a bag of forgotten and quiet happy meal toys with you. Apply the Play-Doh principle when that toy gets super grimy. Use a piece of string to tie a toy to the highchair in order to add to the fun and protect you from a rousing game of “I Throw It Down, You Pick It Up”. Forgot to pack a toy? Never underestimate the peek-a-boo potential of a napkin. Eating out with another family of littles? Bring extra toys for sharing. Crackers! I was a waitress in college. Food servers will spit in your food if your child trashes their station with crackers. I speak truth. PHONES! There isn’t an app on the planet that can top focused attention from you … or the magic of Play-Doh. Pack a healthy snack for your kiddos to eat as an appetizer. Hangry children are almost as mean as hangry mommas. 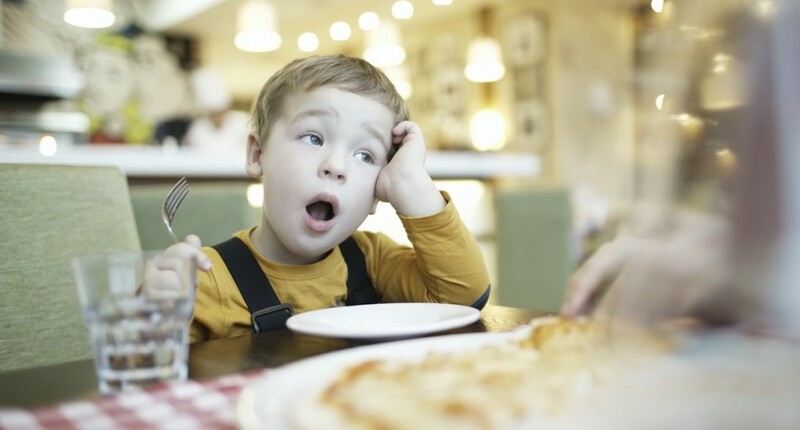 Eating out with preschoolers can be fun with a little creative planning. All you need to do is pretend it’s 1994, grab some toys and snacks, put down your phone and enjoy the conversation. I’m not a super organized mom. I may forget to pack wipes, but I NEVER forget Play-Doh.